A man has stunned people around the world with his lifestyle after it was revealed that he swims to work every day to avoid traffic. Most commuters in Munich, Germany, spend hours stuck in traffic or trying to squeeze into one of the overcrowded subway trains, every morning, but for 40-year-old Benjamin David, commuting is actually a relaxing experience. Every day, he jumps into the Isar River and swims two kilometers to his workplace in Kulturstrand. Benjamin David used to be one of the thousands of Münchners trying to make their way to work on busy roads and cycling paths, but two years ago he decided that he needed to find a simpler alternative and the Isar River seemed like the obvious answer. It flows right past his apartment in Baldeplatz, and, even though no one has been using it for traveling purposes in decades, it used to be the best ways to get around. People traveled up and down the Isar using rafts, and, at one point, it was one of the most popular routes between Rome and Vienna. But instead of paddling on a raft, Benjamin decided to swim to work instead, and that’s been his main commute for the past two years. 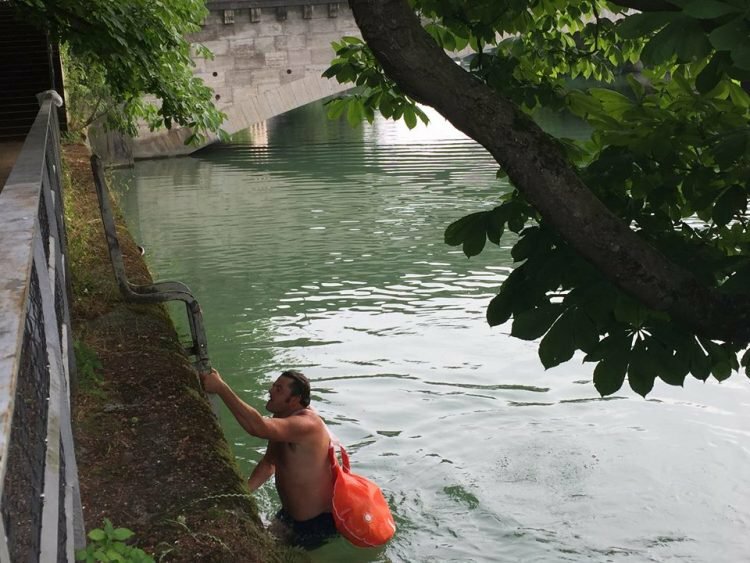 Every morning, Benjamin, the founder and spokesman of a small think tank for culture and commerce in public places, leaves his apartment in Baldeplatz, crosses the street and jumps into the Isar River. He has to swim two kilometers to his office in Kulturstrand, which usually takes him about half an hour. Once there, he dries himself with a towel, puts on a t-shirt and waits for his colleagues to get through the heavy traffic, by enjoying a cappuccino at a cafe. The swimming commuter found the perfect way to keep his things dry while he is in the water – a special bag that is not only waterproof, but also fills up with air when you roll it shut, acting as a buoy. It’s called a “Wickelfisch” and it was designed by a startup in Basel, Switzerland, where swimming to work has actually become a big trend. It holds Benjamin’s laptop, paperwork and clothes dry, and allows him to simply float down the river if his arms get tired. Depending on the season and temperature of the water, Benjamin will put on a simple pair of shorts or a wet suit, but he always wears rubber sandals to protect his feet. People throw all kinds of things in the river, from glass bottles to bicycles, and the sandals provide protection. But, even so, swimming in a river can be dangerous. Benjamin is a family man and he doesn’t want to risk his life just to save some time, so, every morning, before leaving for work, he goes online and checks the water level, temperature and the strength of the currents. If everything is withing safe limits, he heads for the river, but if not, he opts for one of the conventional means of transportation. 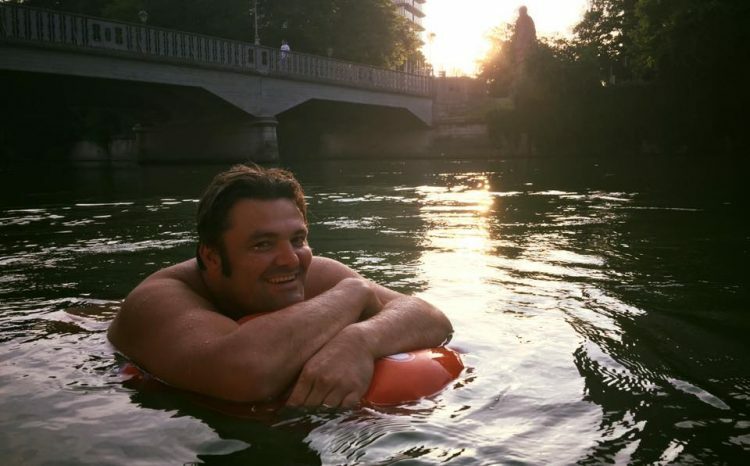 Right now, Benjamin David is the only person in Munich who uses the Isar River for his work commute, but with around 30,000 new people moving to the German city every year, traffic isn’t getting any better, so he expects some of his fellow Münchners will be joining him for a daily swim soon. This isn’t the first time we’ve covered unusual work commutes. Just a couple of weeks ago, we wrote about Curt von Badinski, a Los Angeles man who takes an airplane to work every day, but there were also the stories of Gabriel Horchler and Fang Shuyun, both of which have also been using a river to avoid heavy traffic.